Condor Ferries is an operator of high speed passenger and conventional freight ferry services between the United Kingdom and the Channel Islands of Guernsey and Jersey. The company also operates a high speed ferry service between the Channel Islands of Guernsey and Jersey and St Malo in France. Condor Ferries established the first high-speed car ferry service to the Channel Islands from Weymouth in 1993. 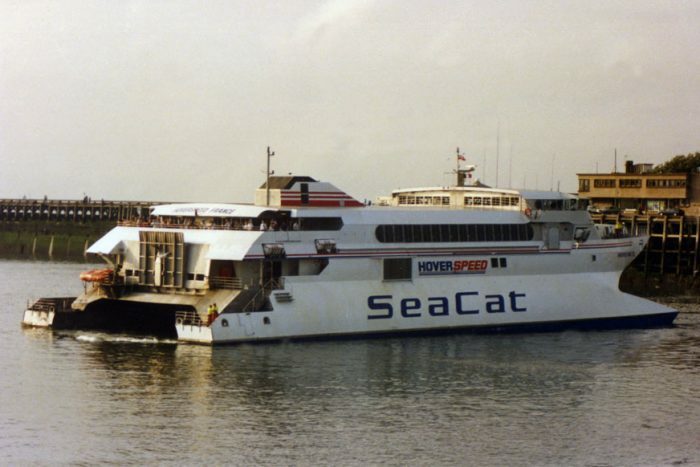 In the winter of 1993/1994, Condor’s parent company, Commodore Shipping, took over British Channel Island Ferries (BCIF) which operated conventional ferry services to the Channel Islands from Poole. HSC Condor Rapide, ex Sea Leopard, SpeedOne, Winner, Incat 045, HMAS Jervis Bay, Incat 045 – Aluminium catamaran built in 1997 by Incat (International Catamarans) Australia Pty. Ltd., Hobart, Australia (Yard No. 045) for International Catamarans Pty. Ltd., Hobart, Australia as a car and passenger ferry.